Places you visit : Delhi, Udaipur, Chittaurgarh, Mahesana, Ahmedabad, Sasan Gir, Palitana, Udaipur, Jaipur. Highlights : Visit to several of historical monuments at famous places like Jaipur, Udaipur, Chittaurgarh, Ahmedabad and Palitana. Visit to world famous Lion Sanctuary at Gir. Enjoy cultural and wildlife photography. 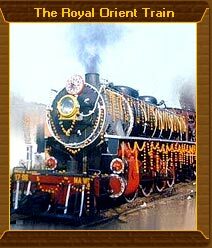 Covering the 7 days of vacation by taking up train ride on the historical train, The Royal Orient Tpur constitutes a great joy for tourists willing to explore two princely states of India, Rajasthan and Gujrat. The high standard of accommodation on the train enable tourists to enjoy the very royal experience, which only Maharaja and rulers of princely states could avail. . The Royal Orient Tour takes you to enjoy sightseeing of several important tourists spots of Rajasthan and Gujrat, such as Chittaurgarh, Mehsana, Ahmedabad, Sasan Gir, Palitana, Udaipur and Jaipur. Day 1: Delhi. Board on Royal Orient at 3 afternoon. Overnight at train. Day 2: Chittaurgarh-Udaipur. Arrive Chittaurgarh early in morning. Visit historical fort of Chittaurgarh. At noon (12:15), arrive at Udaipur, and enjoy sightseeing of popular tourist spots like City Palace, Shilpgram, Royal Garden and Pichola Lake. Overnight at train. Day 3: Junagarh. Arrive here afternoon at 2. Visit to its famous historical sightseeing spots like Ashokan Rock Edict (3 century BC), Durbar Hall Museum, Nawab Mahabat Khanji Mausoleum. Board on train, and reach veraval at 6 in evening. Visit to world famous Somnath Temple on the shore on Arabian Sea. Overnight at train. Day 4: Sesan Gir-Dilwara. Arrive Sesan Gir early in morning. Visit its world famous Gir National Park, renowned for its Asiatic Lions. Board on train, and reach Dilwara afternoon. Visit to popular Mandir Beach and St Pauls Church. Day 5: Palitana-Sarkhej. Arrive Palitana in morning. Visit its popular Jain Temples at Shatrujjay Hills. Reach Sarkhej by evening 7. By bus, reach to Ahmadabad. Overnight stay at hotel. Day 6: Ahmedabad. Enjoy full day sightseeing of Ahmedabad, which includes sightseeing of popular spots like Gandhi Museum, Calico Textiles Museum, Sidi Aayyad Mosque. Drive back to Sarkhej, and board on train. Overnight at train. Day 7: Jaipur. Enjoy whole day sightseeing of Jaipur. Visit to popular locations like Hawa Mahal, Jantar Mahal, City Palace, Birla Temple, Amer Fort and Nahargarh Fort. Board on train in night. Day 8: Delhi. Reach Delhi early in morning. Our representative will transfer you to the airport to catch your flight for onward destination. Enjoy the world class hospitality while on board, which only few of luxury trains of the world offer to guests. The royal accommodation of the train takes you back to the era lived by Maharajas of princely states like Rajasthan and Gujrat. Furnished much better than 5 star hotels, the train and its international standard of hospitality add unparalleled joy to your vacation. Visit to some of the most famous historical places of Rajasthan and Gujrat take you to explore its rich cultural and historical heritage. See many of historical monuments at poplar places like Jaipur, Udaipur, Chittorgarh, Junagarh, Dilwara and Ahmedabad. Moreover, game viewing at one of the worlds best Lion Sanctuary, Gir National Park give you an opportunity to spot rarely found Asiatic Lions at its natural den. Photography and shopping at many of colourful bazaars are another activities, you shall love to engage into.